The IRS begins updating its systems for acceptance of electronic returns in the fall before tax season opens. The final changes usually happen around late December. They plan ahead to allow adequate time to program and test the upcoming year tax processing systems. If you filed your taxes early and checked your refund status. You may have possibly received this message. Congratulations, your tax return was selected for processing before the official opening date, the IRS only accepts a small number of tax returns as a part of the “Controlled Release Testing” or “HUB Testing” to make sure their systems are up in running smoothly and ready to go for the season. What is an IRS HUB Testing or Test Batch? HUB Testing or (Test Batch) is an initial run of a batch of tax returns. The IRS will pull a few early tax returns from all their registered tax preparers to make sure the software is running up to speed. 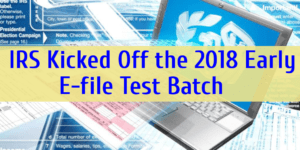 Every tax season about a week in advanced the IRS routinely runs a Controlled Release Process(“test batch”) from various e-file providers (including free online e-file services) every year to test their systems. A small number of e-filed tax returns may be transmitted to the IRS, and taxpayers may see real acknowledgments and rejects as a result. The income tax returns included in this testing procedure are randomly selected from “batches” of completed tax returns that are queued for transmission for the official opening date January 28th when the general e-file processing begins. This testing period DOES include not only the acceptance of these tax returns via e-file but also the processing of the returns including the issuing of any tax refunds. Based on previous years we have seen test batch returns actually receive their tax refunds usually in the first batch of deposits as long as they filed an accurate and honest return that had no processing issues. How many tax returns does the IRS pull for test batches? The IRS Processed 132,319,000 E-Filed Returns in 2017 and the number of early filed tax returns selected for test batches may be fewer than a million. Please Don’t Get Your Hopes Too High… The majority of all e-filed returns submitted will be held until the IRS Modernized e-File (MeF) system opens this year on January 28th. If my tax return is selected in the test batches will I get my tax refund any sooner? If you have a tax return that does not have the EITC/ACTC Credits you could possibly get a refund as soon as the first few weeks in February. 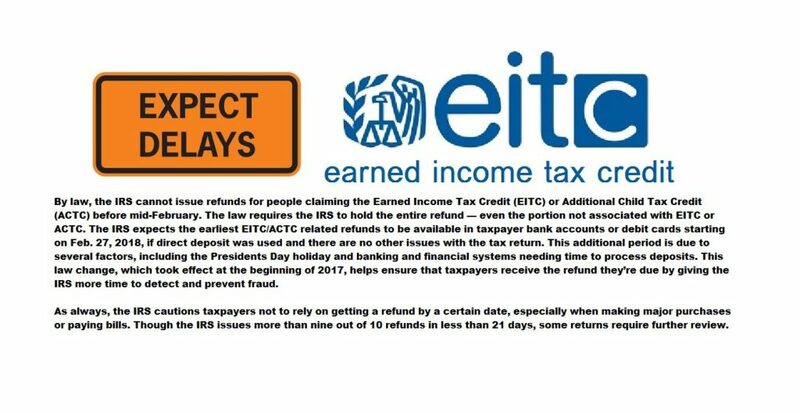 If your tax return includes the EITC/ACTC Credits and completes the test batches your tax return will still be on hold until after February 15, 2019. Many different factors can affect the timing of your tax refund after the IRS receives your return. Even though the IRS issue most refunds in less than 21 days, it’s possible your refund may take longer. Also, remember to take into consideration the time it takes for your financial institution to post the refund to your account or for you to receive it by mail. Where’s My Refund? ‎on IRS.gov and the IRS2Go mobile app will be updated February 16 for the vast majority of early filers who claimed the Earned Income Tax Credit or the Additional Child Tax Credit. Before February 16, some of these filers may see a projected date or a message that the IRS is processing their return. These taxpayers will not see a refund date on Where’s My Refund? ‎or through their software packages until then. 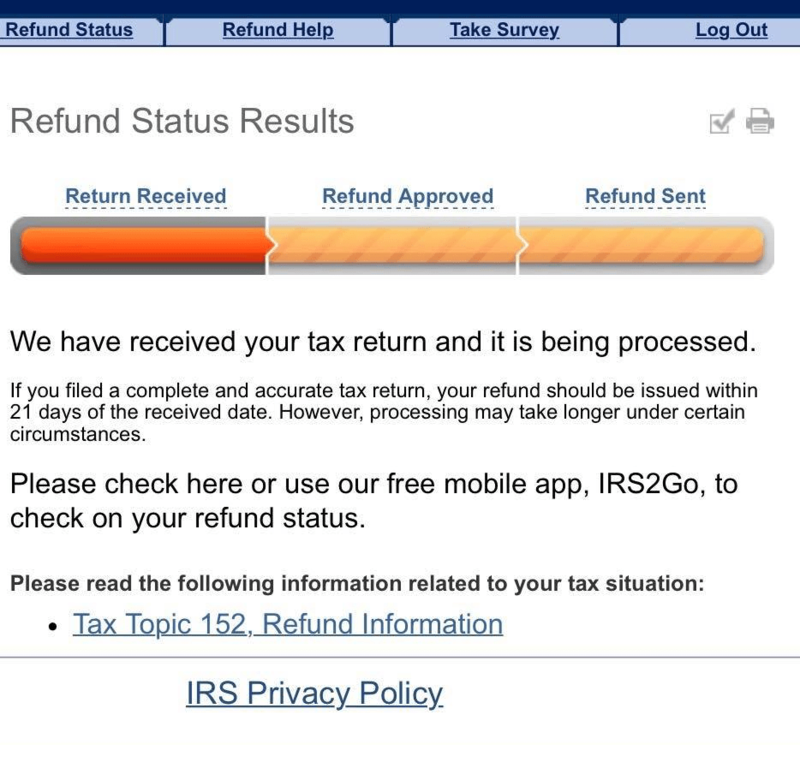 The IRS, tax preparers and tax software will not have additional information on refund dates, so Where’s My Refund? remains the best way to check the status of a refund. As to the “secret” for getting your tax refund first? If there is one, we don’t know it. I’m sure that the IRS knows – but they’re not talking. We’ve checked with tax professionals and with tax prep software providers and they don’t seem to know either. *We do know that no matter how early you e-file your tax return. There is no guarantee that tax returns sent to IRS Electronic Filing Center from your tax preparation service will be transmitted to IRS early. If your tax return was selected to take part in the IRS test batches this year or in years past please feel free to share your experiences below.